Thursday, March 8, 2018 4 p.m.
Departure at Pavillon Saint-Viateur at 4 p.m. Final scene at Théâtre Outremont at 5 p.m.
Official opening at Théâtre Outremont at 5:30 p.m.
Les Bêtes dansent ou le sortilège discret de la nature sauvage is an awe-inspiring street performance that draws the public into a large-scale animal menagerie. The wolf, symbol of our worst fears, is at the heart of this celebration of the beauty and mystery of life on Earth that cuts across territories and cultures. 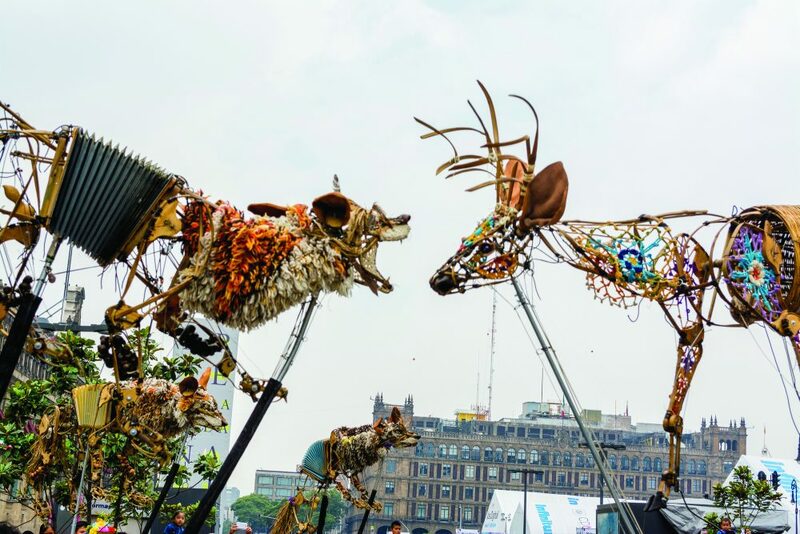 The giant animals are skilfully manipulated by a team of artists from Mexico and Québec, with a little help from local children. Young and not-so-young stand spellbound as the story of a pack of wolves and a magnificent deer unfolds around them. An ancestral dance between hunter and prey. Founded in 2011 in Mexico, by actress and stage director Jacqueline Serafín, and caricaturist, sculptor and puppet inventor Iker Vicente, La Liga Teatro Elástico seeks to engage the public in an active and playful way. The company’s approach is at the crossroads of sculpture, theatre, performance and education. La Liga Teatro Elástico’s works – performances and installations – have been presented in Mexico, Spain and South Africa. Casteliers wishes to thank the Consulate General of Mexico in Montréal.